I was walking aimlessly down St. James street in London recently and discovered a plaque noting that the Texas Legation had been based in the building on the corner of Pickering Place in the 1840s (They were trying to establish themselves as an independent republic, so why not send diplomats to the capitals of the world’s great powers?). This is one of the many things I love about London: The past is utterly alive everywhere you turn, sometimes in ways you appreciate and sometimes in ways you don’t. 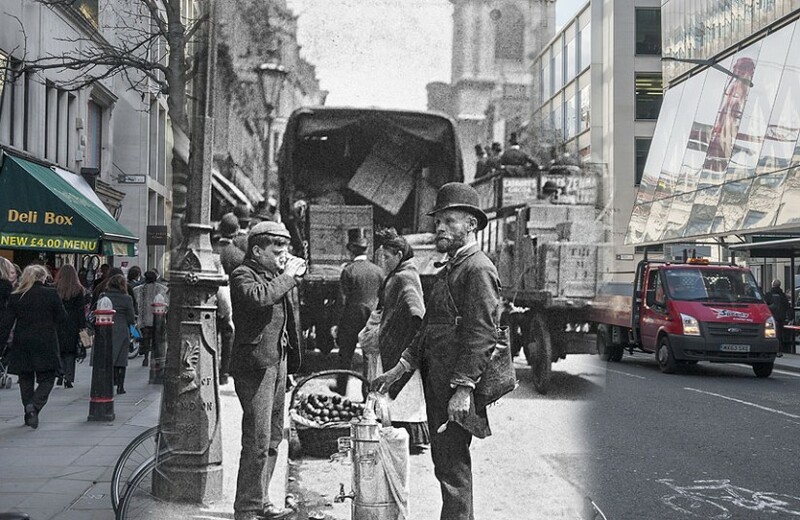 The Museum of London instantiates this reality with clever blends of old and new photos of the same locations. The one below is of Cheapside. There’s 15 more to enjoy as a slide show on the website of the Telegraph. Keith, thank you for calling our attention to this wonderful juxtaposition of old and new. Picture 10 brought back a flood of memories, and a snippet of brand new information. The picture shows Picadilly Circus on Coronation Day, June 2, 1953. The caption reminds us "at the Queen's request, the entire ceremony was televised throughout the Commonwealth, and watched by an estimated twenty million people." That estimate is way low, because it does not include all the viewers in the U.S., plus some in other foreign countries where television was already popular. I remember watching it on TV with my parents; I was ten. Millions across Britain watched the coronation live, while, to make sure Canadians could see it on the same day, RAF Canberras flew film of the ceremony across the Atlantic Ocean to be broadcast by the Canadian Broadcasting Corporation, the first non-stop flights between the United Kingdom and the Canadian mainland. In Goose Bay, Labrador, the film was transferred to a Royal Canadian Air Force CF-100 jet fighter for the further trip to Montreal. In all, three such voyages were made as the coronation proceeded. So the first trans-Atlantic "network" involved film plus the world's first jet bomber. Very creative, I say. And this triggered my interest in those RAF Canberras, which I linked to in Wikipedia. I remember them well, and this link awakened memories that had lain dormant for many years. What an outstanding achievement they were for the fledgling jet aviation industry. I also vaguely remembered the RCAF CF-100, so I followed that link as well. What an excellent first try that was for the Canadians. Designed for an operating life of 2,000 hours, the airframe was so stoutly built it could survive ten times that long. A famous story that brings us back to another time. I have a friend in London who has studied the coronation and said that it was the spur for a huge burst of television buying in the U.S., which really surprised me. I love the moment in the movie 84 Charing Cross Road when Anthony Hopkins and his friends watch on TV, all wearing suits and their military decorations and then when the queen appears, everyone in the living room silently stands up.